A new video from a NASA spacecraft shows the huge asteroid Vesta's complex surface in dazzling and colorful detail. The video drapes high-resolution false color images snapped by NASA's Dawn probe over a 3-D model of Vesta constructed from the spacecraft's observations. Dawn has been orbiting Vesta — at 330 miles (530 kilometers) wide the second-largest object in the main asteroid belt between Mars and Jupiter — since last July. 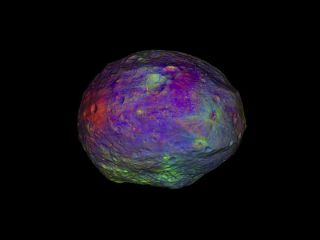 During its time at Vesta, Dawn has confirmed that the enormous space rock is actually an ancient protoplanet — a planetary building block left over from the solar system's earliest days. If Vesta had formed nearer to the sun instead of out in the asteroid belt near Jupiter, it may have been incorporated into a rocky planet like Earth or Venus. But Jupiter's gravity made it tough for Vesta to hook up with others of its kind, so the space rock's development along a planet-forming path was stunted, scientists say. The colors in the new video of asteroid Vesta were chosen to highlight differences in the protoplanet's surface composition that are too subtle for the human eye to pick up, NASA officials said. Researchers are still trying to figure out how to interpret some of these colors, but the meaning of other hues is more clear. Green shows the relative abundance of iron, for example, and the smatterings of orange reveal that debris thrown out from some of Vesta's impact craters is different from the surrounding surface material. Dawn imaged the majority of Vesta's surface with its framing camera in September and October 2011 to provide this 3-D map, officials said. Some areas in the asteroid's north were in shadow at the time, but the Dawn team hopes to fill in those gaps with additional observations as sunlight creeps toward the asteroid's north pole. Dawn is scheduled to leave Vesta around Aug. 26. At that time, it will embark on the long journey to the dwarf planet Ceres, the largest object in the asteroid belt. Dawn is expected to arrive at Ceres in February 2015.